The Trautwein-Roller: MP3 in 1984? I will never make another Scooop comment again. Building one will be our first project when you move back Brooke! ya, but I don’t want to tilt. I want it square so it can handle snow better and I can roll on 19″ dubs. I had a pic of the PX version on my old computer! I hadn’t seen this PK version but it is truly awesome! 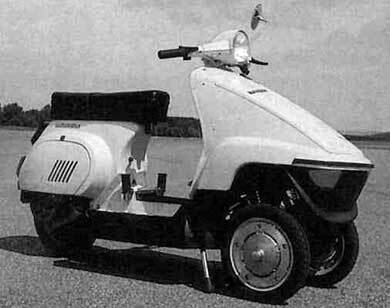 If I were to get a Scooooop or PiaggioMp3 would probably be my favorite thing ever. Next Next post: Qatar two-fiffy roundup.